In an exclusive VIP launch Howards Group proudly introduced Kia to Weston-super-Mare. The stunning new state of the art showroom was well worth the wait at the Howards Group Hildesheim site. The £750,000 development took four months to build and includes a separate customer waiting lounge with luxurious leather sofas, a 51-inch plasma screen, free WIFI, air-conditioning and built in drinks dispenser and water cooler. Within the six-car showroom there is also an eight-bay workshop that will be manned by a Kia trained master technician, offering the highest level of expertise and service for all Kia customers. Howards Kia will stock not just new, but a vast array of nearly new cars and are also an authorised replacement parts dealer for Kia. 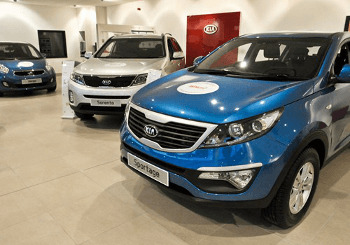 Tony Lippe, Howards Group Franchise General Manager, said:“We are really excited to take on the Kia franchise and have created a visually stunning showroom. We can offer an exceptional level of service with our own fully-trained Kia master technician. “Although we are very new to the brand we have secured the services of a master Kia technician to work alongside our existing team. Tony explained that it was a brand new Kia franchise for Weston-super-Mare, with new management and staff. “We hope that existing Kia customers who have had to travel to Taunton or Bristol for services after the previous Kia dealership closed will now come back to us at Kia Weston-super-Mare. At the official opening an exclusive VIP invitation was sent to 1,000 existing Howards Group customers who were entered into the prize draw to win a 51-inch plasma television. As a launch offer Howards Kia teamed up with the manufacturers to offer brand new 13 plate Kias at unprecedented prices. These prices were unveiled at the event held on Saturday 9th March 2013.